Well, we had a blast, as usual. Chance and family and I went down Wednesday afternoon and Dusty and Tris went along and camped with us also. Cindy got Gabe on Thursday evening and came down. Hot, by and large, but it usually is. There had been a l;ittle change in managing it so everyone was wondering, but it turned out great. More mellow it seemed. fewer artists than the year before, but still more than many years. Fewer models, but still more than enough. We had some new artists and some old, new models and old and everyone worked together and i think the artists were pleased. We took 4 horses and two ponies and a pony colt and they worked out well. Had one scene where Gus and Sam all dressed in woolies, scotch hobbled the pony, blindfolded it and one hung on the head while the other mounted and took the blinds off. No bucking, but that was okay. We did the same with a horse.. again, no bucking and of course not Sam or Gus, but Chance and Dusty. A great time and we are already thinking about some new stuff for next year. I never took any photo’s but here is one Hope took for me. 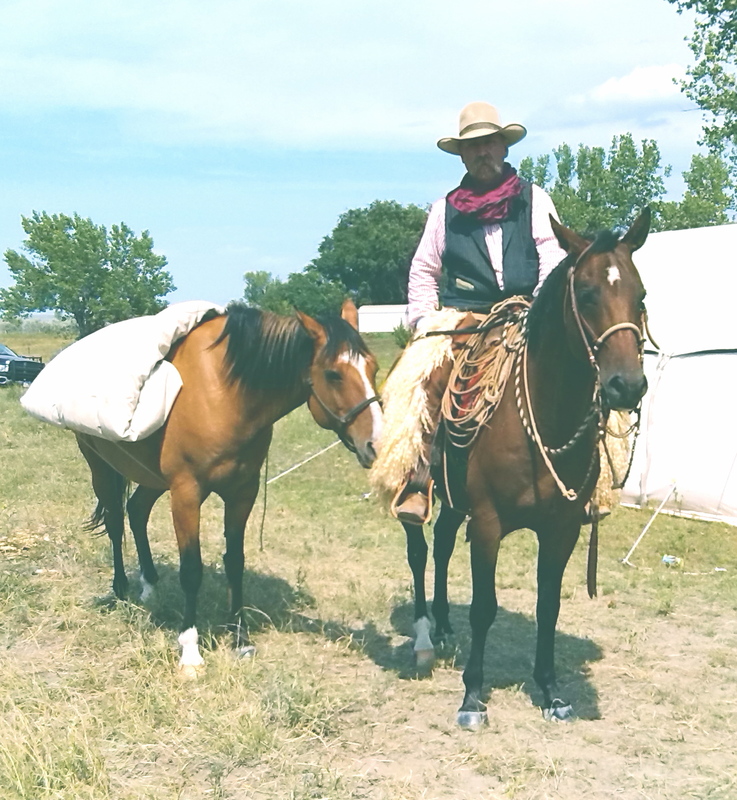 I put my bedroll on Beaver like the old timers did it when traveling across country repping, with no pack saddle, just the bed roll tied on with a rope. This is how a cowboy would carry his worldly possessions and “40 years gatherings” when he went from one job to another. When repping they would also have their string of horses, tied together or just drive them along in a bunch. Loved the picture! Hope someone uses the boys in their woolies! So glad you and others come for the Artists! “Keeping the American Cowboy Alive”! She took a great picture! Glad to hear it went well! Even better that the family got to go! Boy Mijo sure looks like Maddie! I’d kind of forgot about using just a bedroll as a pack with no saddle. I’m trying to remember now how Irwin showed me it was done. It’s different the way you’ve done it I believe than the way He showed me. I’m curious about your pack and maybe we’ll visit about that sometime. Yes it was upside down to what he showed me. The snaps would have caused a sore I suppose. Not sure about the rope and the way he showed me to tie the pack on. Couldn’t see that well enough. Thought maybe you’d come across some one who’d showed you another way as I believe too that there were lots of ways to do it. He flipped the ends of his bed roll up to the outside and used that to carry his food. Probably in burlap sacks such as canned milk, beans, flour or salt pork,taters or whatever was available. He also said he tied a coffee pot, frying pan and an axe to the ropes he tied it up with. He was herding cattle on the reservation when it was all open range and had to stay with them.